Built for easy travel between on-site locations and studios, the G-SPEED Shuttle 32TB 4-Bay Thunderbolt 3 RAID Array from G-Technology delivers storage for demanding workflows, such as 4K, 8K, high dynamic range (HDR), and high frame rate (HFR) footage. Its sustained data transfer rates of up to 1000 MB/s allow users to edit multi-camera footage in real time, render multi-layer effects, and export efficiently. Featuring an overall capacity of 32TB, which is split over four 8TB 7200 rpm Enterprise-class SATA 3.5" hard drives, this array comes pre-configured in RAID 5, which provides a good balance of performance and data redundancy, but is also able to be configured as RAID 0, 1, and 10, each of which provides performance, data redundancy, or a combination of both. The G-SPEED Shuttle comes preformatted for macOS 10.12 and later, but can be used with Windows 10, 8.1, and 7 via a simple reformat. It achieves connectivity with its dual Thunderbolt 3 ports, each of which provides bi-directional transfer speeds of up to 40 Gb/s and is backwards compatible with Thunderbolt 2. While one of the Thunderbolt 3 ports is used to connect to your host system, the other may be used for daisy chaining up to five additional Thunderbolt-compatible devices together, including additional storage, displays, and docks. Included is a Thunderbolt 3 cable and a power cord, and protection is provided by a limited 5-year warranty. With a capacity of 32TB, the G-SPEED Shuttle delivers high performance storage to save all your favorite 4K or 8K high dynamic range (HDR) and high frame rate (HFR) footage in a single location. With transfer rates of up to 1000 MB/s, the G-SPEED Shuttle delivers the performance you need to quickly ingest content and natively edit footage to make changes in real time. Built for easy travel between your on-site production location and to the studio for post-production, the G-SPEED Shuttle delivers powerful, transportable storage to help improve your workflow efficiency. Built for multi-stream 4K and 8K production workflows, the G-SPEED Shuttle offers the bandwidth to support multi-camera editing in real time, render footage with multi-layer effects, and quickly export in an efficient workflow. 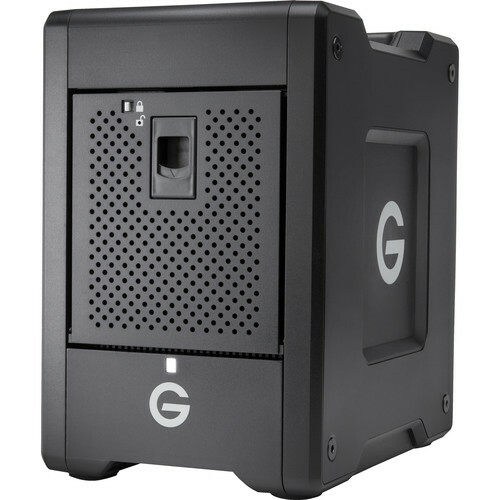 For maximum performance, the G-SPEED Shuttle comes in RAID 5 out of the box and supports RAID 0, 1, and 10 to provide a versatile and flexible storage solution. With dual Thunderbolt 3 ports, you can conveniently daisy-chain up to 5 additional devices, keeping you connected to multiple drives, 4K displays, and more, through a single connection to your computer. For all your demanding workloads and mission-critical footage, you can depend on the power and enhanced reliability of four 8TB removable Enterprise-class 7200 rpm hard drives. G-SPEED Shuttle 32TB 4-Bay Thunderbolt 3 RAID Array (4 x 8TB) is rated 5.0 out of 5 by 1. Rated 5 out of 5 by Lindsay from bomber This is built like a tank! Everything went smoothly; downloaded drivers as recommended BEFORE connecting the unit, and opened the utility. The only tricky part was reformatting to RAID0 (it comes at 5 I believe, so showed an availability of 24TB vs the full 32TB) I had to call tech support, but that was great and got a human right away who helped me reformat. You have to delete the physical volume in order to do so, which wasn't readily apparent. I've transferred 28TB onto it with no hiccups! The handle is awesome and the build really makes me confident it's secure.